20.76% - Reading the books in hardcover. 19.24% - Reading the books in paperback. 14.18% - Reading on my Kindle, Nook, or other e-reader. 12.91% - Listening to the audiobooks on my iPod or other portable device. 7.59% - It depends on the situation, or what mood I'm in. 4.81% - Listening to the CDs. 3.04% - Reading on my iPhone, iPad, or similar device. 14.94% - All of the above. 0.25% - I haven't yet read any of Diana Gabaldon's books. There were 395 votes in this month's poll, and I think the results are very interesting. I was surprised by the number of people who voted "all of the above". Thanks so much to everyone who participated! Please take a moment to vote in the January poll, which is all about excerpts: do you read them or avoid them? 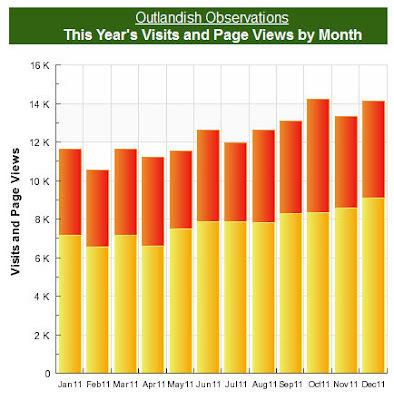 The chart above shows the number of monthly visitors (in yellow) and page views (red and yellow combined) for Outlandish Observations in 2011. You can see why I've been delighted with the results in the last few months! This is a very positive trend, and I hope it continues through 2012.